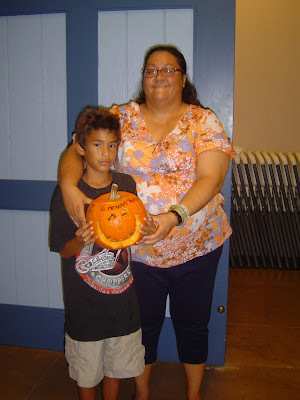 One of the children from the Ohana Ola O Kahumana transitional shelter in Waianae who participated in the pumpkin carving contest. Mahalo nui loa to the Hallowbaloo Music & Arts Festival for sponsoring the pumpkin-carving contest for the children of Ohana Ola O Kahumana transitional shelter in Wai`anae on 10/30/08. The children and families had a blast carving the pumpkins. Special mahalo to Mark Tarone of T-Rx Entertainment, who came up with the idea for the pumpkin-carving contest, and was the overall coordinator. Thanks also to Marsha Joyner of The Peace Center, who coordinated the donation of the prizes. You have truly demonstrated that it is better to give than to receive. Happy Holidays!